The concept of the Scottie Rally began in the winter of 2000 shortly after our first Scottie, Shayna was diagnosed with transitional cell carcinoma (commonly known as bladder cancer). What began as an idea to gather a few families on our property to celebrate our relationships with the Scottish Terrier quickly grew into the formation of a non-profit organization for the purpose of fellowship, education and fundraising for Scottie health research and rescue and an annual gathering attracting attendees from across the globe. We have been blessed to have been owned by seven Scotties and currently share our home with Finnegan, Sparky and Katie. We understand the pain in losing one of your clan and also are confident in our hearts’ ability to open and love another, yet never forgetting any of our furkids. Since Michele and Tom believe in supporting the specialty organization that is committed to the maintenance and ethical breeding practices they are members of the Scottish Terrier Club of America (STCA) and the Scottish Terrier Club of Chicago (STCC). Their decision to join STCA nearly two decades ago has resulted in the recognition of and respect for the work that is done by DCSR. It’s clear that since 2001 the Door County Scottie Rally has grown into a year-round labor of love and a legacy to every single Scot that has enriched all of our lives. Michele and Tom are grateful for the support of past and present Board members and all volunteers who make DCSR a success year after year. Ken and Rose started their “dog career” years ago with Gibson who was a Westie mix. Over the years they parented other dogs, but when their first Scottie, Emma joined the family they knew “ this was the breed for us–cute and all attitude!” Soon after Ken was surfing the web for Scottie stuff, found DCSR and as he explains “ flipped and had to come!” They loaded up the motor home (named after Emma), came over, and “ LOVED” the Rally. The next year they volunteered to help, and found it to be a labor of love, camaraderie, and agree that being part of the Rally is rewarding and satisfying. They admit their commitment to DCSR is based on getting together for dog fun and raising funds for Scottie health and welfare. Both Ken and Rose bring their entrepreneurial experience and artistic talents to the Rally each year…often creating and donating original pieces such as Scottie mailboxes, exterior house/barn quilts and one of a kind quilted items. Ken serves as our LIVE Auctioneer enticing the highest bids from our attendees and as our Treasurer, Rose assists the Board in being fiscally responsible year round. They have had a long standing commitment to providing 2nd chance homes to furkids and their 4 paw census has been up to sixteen at one time. Their long term canine advocacy for optimal nutrition and weight maintenance led to their creation of their homemade SHEF food—named after Spike, Hamish, Emma and Fiona. They currently share their home with three Scotties–Fiona, Atticus and Finian. Gene’s introduction to Scotties came in 1973 with the addition of a life-changing puppy into a busy lifestyle that involved travel across the United States—-where Scotty was always adored by the motel/hotel housekeepers. Decades spent sharing life with Scottish Terriers provides us with opportunities to be caretakers and Gene has had such experiences with numerous Scotties, including managing diabetes with insulin injections, liver cancer, spinal paralysis, melanoma and amputation of a complete extremity. Through it all he has never lost his love for this diehard, brave breed, several of whom he describes as incredibly loving and affectionate . Gene recalls attending their first Scottie Rally in 2007 and “vowed to keep going back – there’s nothing like it in the world!” Since that time Gene has become increasingly involved, volunteering for activities as they arose and often stepping in where needed. Gene has served on the DCSR Board for several years and is responsible for recording of Board meeting minutes and written acknowledgement of donations. In 2013 Gene and fellow attendee, Roy Matuszak began to execute the vision for establishing the Rainbow Bridge Memorial Garden at Door County Scottie Rally headquarters bringing it to fruition and commemoration was held in 2015. The following year, Gene & Roy were presented with the Spirit of Shayna Award for their contributions. Gene shares his home with his spouse, their tripod Scottie, Milis and a number of cats. Well known for their culinary skills, Roy is the creator of the delicious cranberry relish and Gene dedicates countless hours each May baking breakfast coffeecakes and numerous luncheon desserts for the Saturday of each Rally! Most recently Gene undertook the task and funding for the creation of a new DCSR logo which will contribute to better branding for the organization. During her life Nan has enjoyed the company of several kinds of dogs, and explains “I knew nothing about Scotties until my younger daughter, then 12, decided that was what she wanted and managed to persuade me. So tiny Queen Jane arrived and ruled my life and my heart until she flew to the Rainbow Bridge in April 2018 at 15.75 years old. She led the way, several years ago, to our adoption of two rescue boys: George, now 11 and Joey, soon to be 12.” Nan, Joey, and George “ have played agility, rally obedience and barn hunt & we enjoy spreading the word that Scotties can do anything they decide they want to!” Nan and her husband, Dan, have two adult daughters, both are also Scottie devotees. Barb Basche has loved Scotties since she was a kid. She fondly recalls playing with a family treasure of her mother’s childhood— a small metal statue of a Scottie and a stuffed wheat colored Scottie that Santa brought one year. She admits thinking that like many of us, she thought Toto was a Scottie, (instead of the the Cairn Terrier that he really was) and that clearly cemented her love of the breed. Sue Fronsee holds the distinction of being a 2001 Charter Door County Scottie Rally attendee and a Charter Board Member in 2004 as DCSR began the work of incorporating as a non-profit organization. Since 2004 Sue has been instrumental in a number of Rally activities including establishing the rapid Buy It Now sale of “surprise” boxes she creates and fills with treasures; gorgeous baskets for our Silent Auction, the creation and placement of Garden Stones around the Scottie Totem Pole Garden, launching our Garden Stone Workshops and so much more. Sue has been well known to rapidly hop out of her vehicle when she sees a Scottie to tell their owner about DCSR. 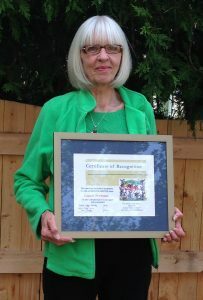 It is no surprise that Sue was the first recipient of the Spirit of Shayna Award and is a consummate advocate for the Door County Scottie Rally. She and her spouse,Tom have been generous with their resources including the donation of innumerable Scottie vintage and collectible items, time and talents. One example of this is the large custom Scottie Sign that is the last thing Parade viewers see on the back of the DCSR haywagon. This signage helps to advertise our organization during the transport of parents and pups in the DCSR Parade of Scots and the 4th of July Baileys Harbor Parade. Thanks to the Fronsees the Rainbow Bridge Memorial Garden features a PAW garden stone for each of the nine original Scottish Terriers that attended the 1st Rally in 2001. Lastly Sue holds the distinction of being one of a handful of Charter Scottie Rally attendees who have never missed a single Rally. In 2005 she was awarded the distinction of being an Emeritus Board Member and is often consulted for her perspective on what the Rally does as an organization.